This is a response for the Ontario Extend module Teacher for Learning, specifically the Metacognition section which looks at metaphor as a culminating task for learning. I’m a big fan of metaphors. I use them to reframe my thinking all the time. Metaphorically speaking, my use of metaphor is like a puzzle. I pick each piece (or metaphor) up, examine it’s edges, analyze it’s connection to the whole puzzle, try it out in certain places, discard it until ready to use it, then put it neatly into place where it fits. Use of metaphors in teaching and learning are sometimes confusing since a common understanding is assumed but not always available. Here is a list of frequently used metaphors for teaching and learning [Learning Metaphors] – planting flowers, playing cards, savings account, switching on a light, eating, being a detective, peeling an onion, a quest, sculpting, and wrestling. I often return to Helen Barrett’s collection of metaphors, in reference to electronic portfolios, [Metaphors for Portfolios] because it extends my thinking. For this Extend Activity I’m going to share my personal learning metaphor – the campfire. I’ve been using this metaphor for teaching and learning for some time now. I’ve described it here, but will elaborate a little bit. Fire is a mesmerizing mixture that captures attention and promotes conversation. It requires combustible materials (the course content, ideas, readings) which are added in a careful sequence to ensure the fire continues safely. It starts with an ignition event (course introductory videos, icebreakers). It continues only if there is air to fan the flames (allowing space for thinking & reflecting) and space between the logs to allow room for flames to grow. Campfires draw people together. These are storytelling, story sharing and thoughtful, thought provoking gatherings where conversations are shared, emotions are revealed and reflection is encouraged. Just as in courses, both in person and online learning, campfires call individuals into roles of listener, speaker, sharer or reflector. 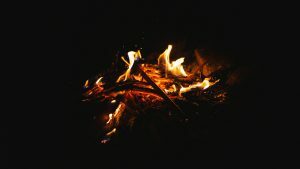 Campfires become a focus, a focal point and an opening for people to talk about themselves, dig into topics of concern, share stories, tell jokes, laugh about mistakes or just sit and watch the flames dance. It’s a ‘third thing’ that shifts the conversations from me to we, us, or it. Gatherings around a campfire have a beginning, middle and end. There is food, drink and movement mixed into the event. 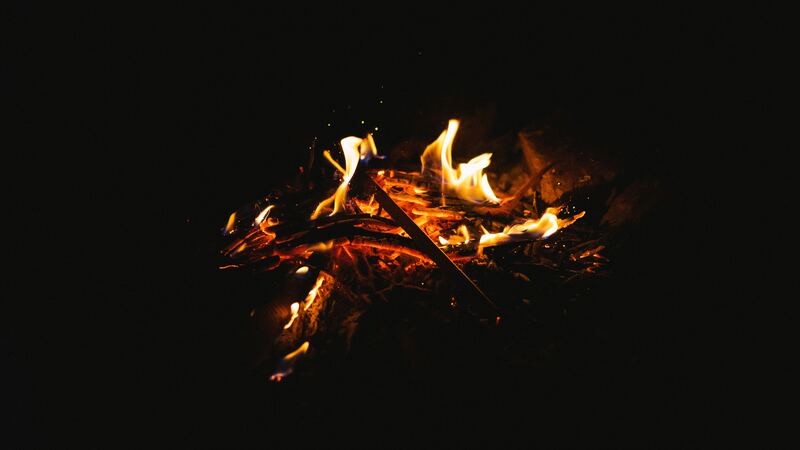 Some campfires go on for longer than others, some are more memorable than others, sometimes those who share the campfire are better suited to being together, but we’ve been bringing campfire events to learners for a lot longer than human memory can capture. My campfire metaphor includes five flames – teaching, learning, technology, talking and togetherness. These five elements come together in physical and online spaces where courses, classes, and topics are shared. Each flame can dance alone, but by bringing all these elements together, the metaphoric intertwining of these flames creates and amazingly beautiful, mesmerizing, memorable event.